Chewy, nutty Pecan Pie Blondies are the perfect Fall treat! Or bake them all year long! There are some desserts that I just don’t eat unless it’s the holidays. For example: Pumpkin Pie. It’s a Thanksgiving dessert….but who bakes one in June? Or how about these Peppermint Puff cookies? Sure I could buy mints all year to bake some…but nope, they are for Christmas only. Same story with Pecan Pie. It’s Pumpkin Pies’ step sister. Not the favorite of most people, but still, only made during the holidays. Which is why I try to find new ways to enjoy Pecan Pie, without the pie. Like these PECAN PIE TRUFFLES, or these Pecan Pie Cheesecake Bars, or this Pecan Pie Cake! Today, I’m sharing a crazy easy recipe for Pecan Pie Blondies. They turn out super chewy with that sweet and salty pecan pie flavor! Line a 9-inch square baking dish with parchment paper. DO NOT SKIP THIS STEP. You want to be able to lift them out of the pan without them sticking! Use Fisher Nuts Pecans (chopped). I’ve been a long time fan of Fisher Nuts as they are preservative free. 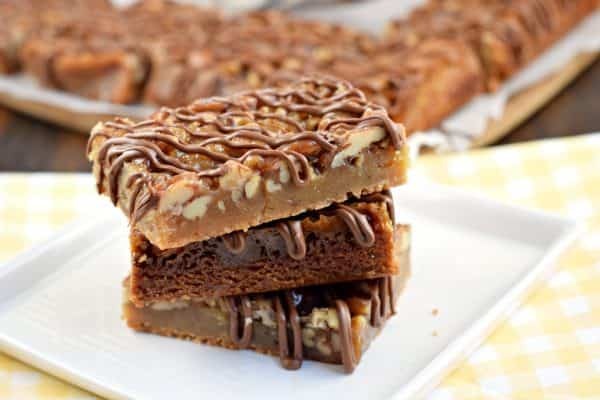 Combined with KARO light corn syrup, the sweet and nutty flavor shines through in these blondies! Don’t forget the chocolate drizzle on top! For best results, refrigerate bars after cooling. Once chilled, cut into bars, and store at room temperature in an airtight container. 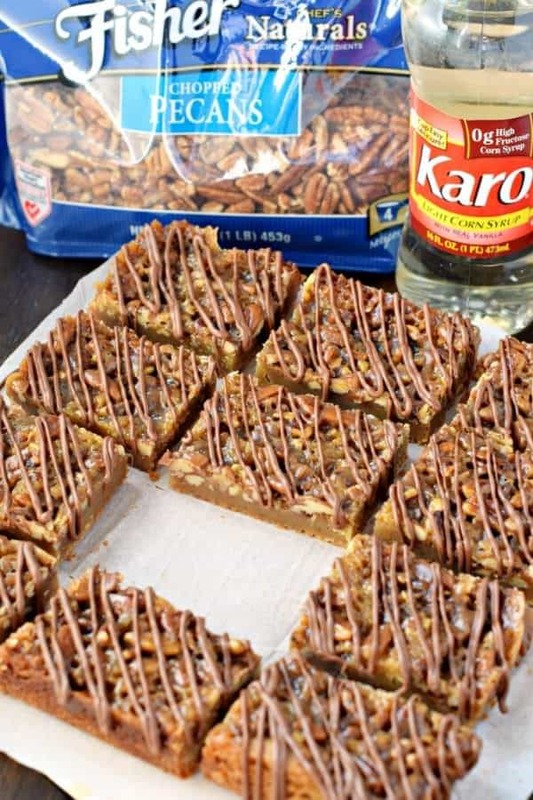 Chilled bars are so much easier to slice, and it allows the pecan pie layer to fully set up! Move over pie…there is a new dessert on the table this year! 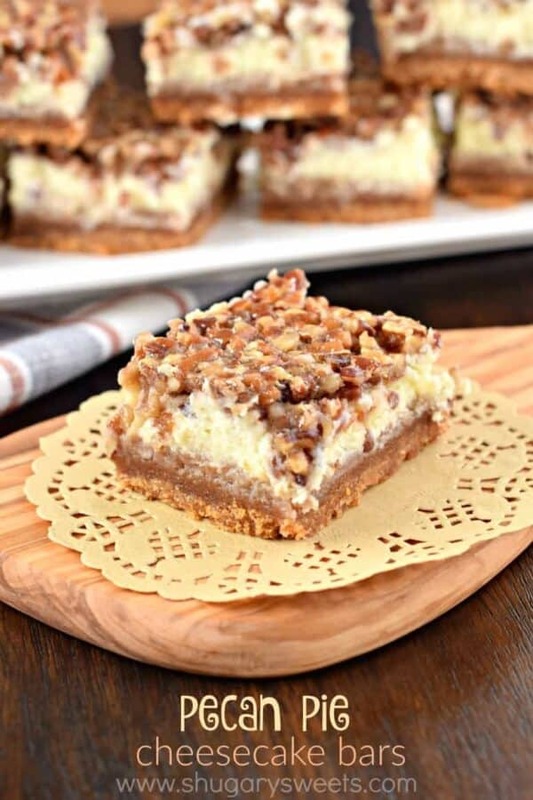 Pecan Pie Cheesecake Bars. Love Pecan Sandies? 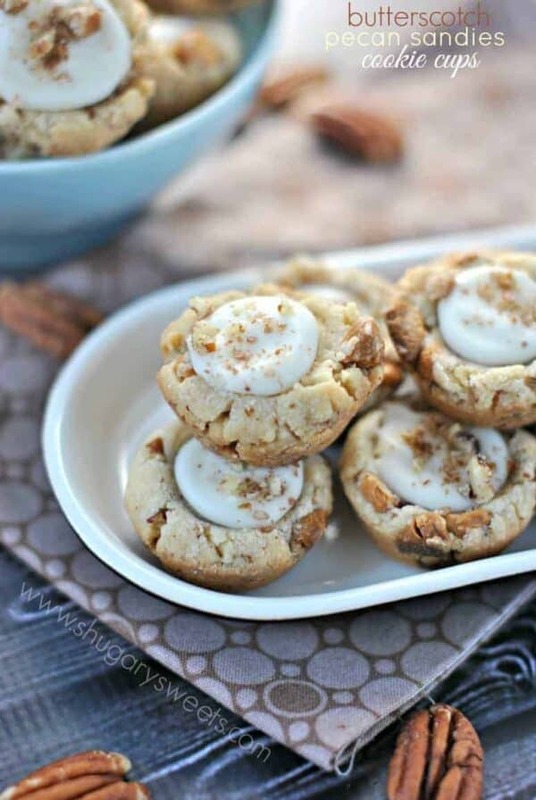 Then you’re going to LOVE these BUTTERSCOTCH Pecan Sandies cookie cups! Not just an ordinary Pumpkin Bar. 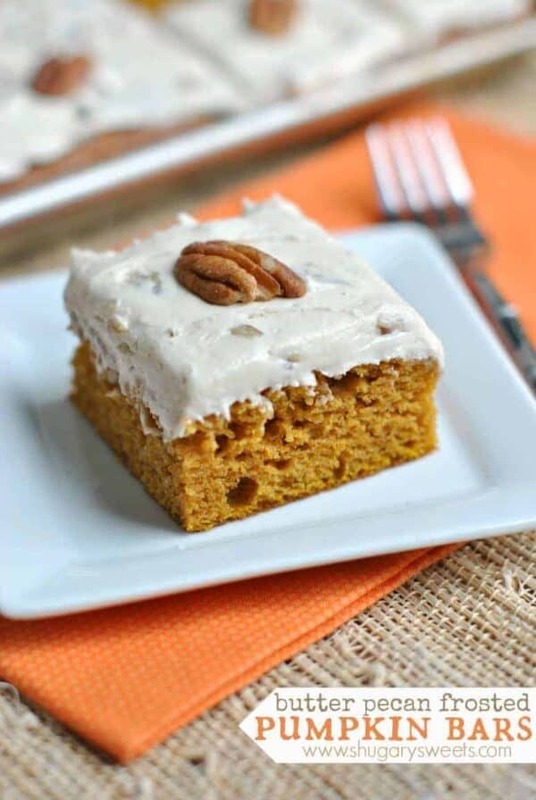 This is a BUTTER PECAN frosted Pumpkin Bar! Chewy, nutty Pecan Pie Blondies are the perfect Fall treat! Preheat oven to 350°F. Line a 9-inch square baking dish with parchment paper. Set aside. For the blondies layer: in a large mixing bowl combine the brown sugar with the melted butter. Add in egg, vanilla and salt. Mix until blended. Add in flour, stirring just until combined. Pour batter into prepared baking dish. Set aside. For the pecan pie layer: In a small saucepan over medium high heat, combine the brown sugar, Karo corn syrup, heavy cream, butter and salt. Bring to a boil, stirring continuously, boil for 1 full minute. Remove from heat and add the almond extract and chopped Fisher Nuts Pecans. Pour over batter in dish. Bake for 30 minutes. Remove and cool completely. Drizzle with melted chocolate. For best slicing, refrigerate for an hour first. Store in airtight container at room temperature for up to 3 days. ENJOY. These look absolutely amazing, I can’t wait to try them! Why is it that we only make certain food at certain times of the year? I adore pecan and pumpkin pie but yup, only make it in November. Well, except for the rare recipes that get made ahead because of blogging. LOL! 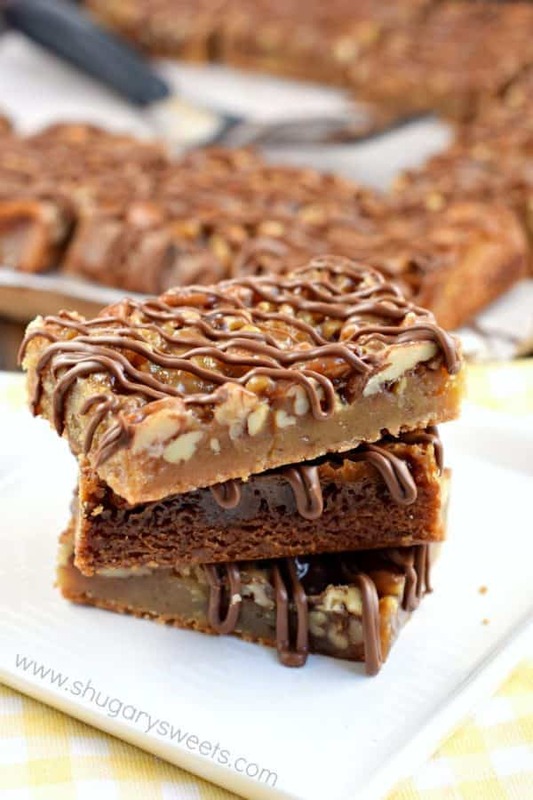 Love that you added pecan pie to blondies ! They look so rich and decadent!! Love it! 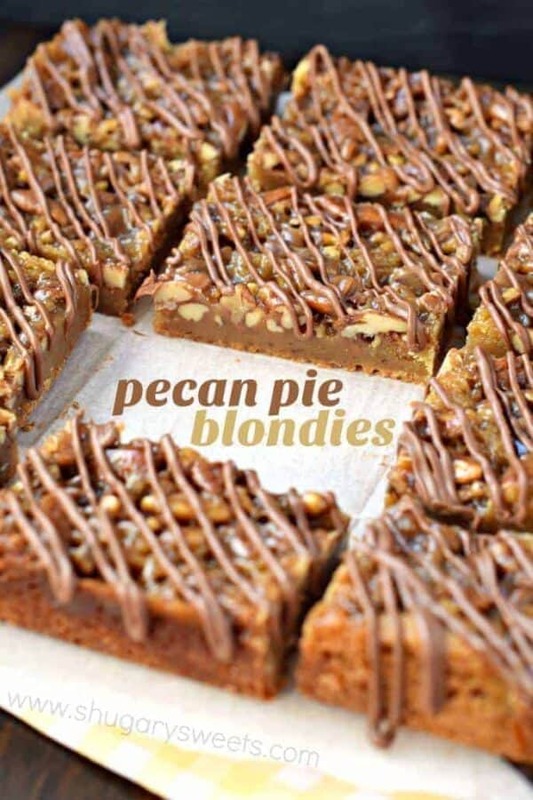 Love that you combined blondies with pecan pie! So perfect for the upcoming holidays! There is no way i could have these in my house! I couldn’t be trusted not to eat the entire plate in one fell swoop! Caramel and nuts! Swoon! 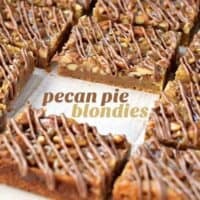 I’ve been making pecan pie bars for over 30 years. By far one of the most popular things I take anywhere. Im anxious to try these . I am a recent convert to pecan pie and I feel so bad that I didn’t appreciate it sooner! I now love it and these blondies look so gooey and irresistible! I didn’t eat it as a kid, it “looked” gross. I regret all those years, LOL. Thanks for the recipe! Do these freeze well? This is an awesome recipe!!!!!!!!!!!! 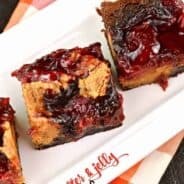 If I double the recipe would a 13×9 pan work? This is such a perfect idea for Thanksgiving when you want to serve something a little more fun than pecan pie! Love this idea!! These blondies were amazing! Definitely adding them to my Thanksgiving dessert table! Oh my, these are absolutely gorgeous!! 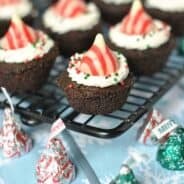 I can’t wait to make them for the holidays!! Well these are amazing! And they’re pretty too! 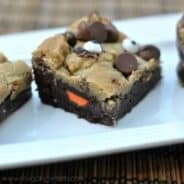 I’ve made these a couple times and they are SOO good! I can’t wait to make them again for Thanksgiving! My mom is going to love these!! adding them to my baking list!